If you need to find a new home for a senior pet, home is the best place to start. 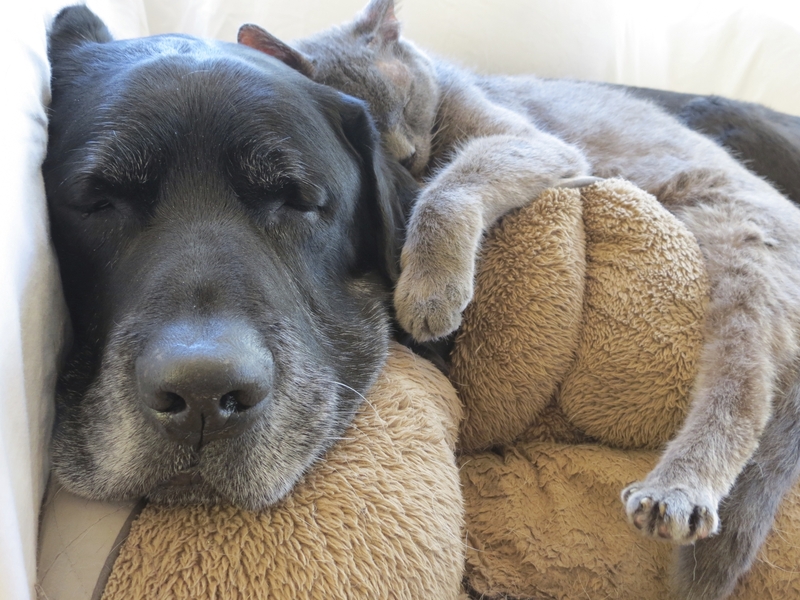 Finding a home for an older dog or cat takes patience and networking and more patience. If you or your family are able to keep your senior pet in his home or with a family member while you work to find a new family for him, that is the best option of all for your senior pet. It causes them less stress and fewer changes in their life, making a transition to a new home easier and gentler on them. Senior pets make great companions, but you have to get the word out there. Below are some helpful hints to help your older dog or cat find a new home. Network your older dog or cat through friends, family, coworkers and within your community through social networking and good old-fashioned word of mouth. Make a nice color flyer of your pet, letting prospective adopters know all about him or her. List likes, dislikes, health issues, etc. The more you share, the more a prospective adopter can figure out if your pet is a good match for them. Make sure the photo of your pet is clear and does not have "flash eyes". A photo of your pet snuggling on the couch, playing with another dog, or sitting happily in the yard is a good photo. Hang this flyer in places older adopters may hang out - retirement or community recreation centers, libraries, coffee shops, churches, temples, etc. Be sure to ask for a small donation to an animal shelter or rescue as an adoption fee. This will help weed out those who are not serious about adding a pet to their family or those who may not have your pet's best interests at heart. When screening potential adopters of your pet, ask to talk to their former or current veterinarian, or ask for personal references to make sure any prospective adopters will care for your pet. So what else can you do to find a new home for your senior pet? You may want to consider our free courtesy post option on our website. The responsibility for screening adopters and finding a good match for your pet is all yours. If you'd like to take advantage of this free service, please send information about your senior dog or cat to webmaster@adoptaseniorpet.com and include photo, description, and contact info. The pet must be 7 years or older, spay/neutered, and in IL/IN/WI/MI. Please be sure to include the location of your pet in the email. Shelters and rescues are welcome to take advantage of our courtesy post services as well. WE ARE CURRENTLY CLOSED TO OWNER/PUBLIC ADMISSIONS AT THIS TIME. Please note that admissions are limited as space allows to senior pets in McHenry co IL, Lake co IL, Boone co IL and the Northern portions of Cook, DuPage, Kane, and DeKalb counties, IL only. Young at Heart focuses its priorities on helping senior pets in open admission shelters first and foremost, and then pre-arranged guardian surrenders through our Furever Loved program due to illness or death. In an effort to divert senior pets from entering the traditional shelter system, other senior pets are accepted as space allows and on a case-by-case basis with the following criteria: We prioritize admitting senior pets from senior people who can no longer care for their dogs or cats due to assisted living admission, health or physical limitations, or guardian death. Documentation proving need may be requested. We will occasionally consider other criteria as well. We suggest that a tax-deductible donation be made to Young at Heart at the time of admission. We have a lifetime commitment to all of the senior pets in our care, and provide a safety net should your pet ever need to find another new home after being admitted into the Young at Heart program. If you have a senior pet that you need to rehome and would like your pet to be considered for admission into the Young at Heart adoption program, please fill out the inquiry form below. Please note that filling out the inquiry form does not guarantee that your pet will be admitted into Young at Heart's adoption program. WE ARE CURRENTLY CLOSED TO OWNER/PUBLIC ADMISSIONS AT THIS TIME. What happens if your pet is a candidate for our adoption program and is admitted to Young at Heart? Placement in a foster home or adoption center until a loving home is found. High quality pet food and supplements. Veterinary care for any needs that come up while in our care. Flea/tick preventative and Heartworm preventative. Screening of potential adopters, including home visit and reference check. Regular follow-ups and home visits with your pet in his new home to ensure the adoption has been successful. A "home for life" with Young at Heart should an adopter not be found. Any donation made will also help us rescue other senior pets needing a second chance. We are committed to each pet in our program for life. Should your pet ever need a new home after joining our program, we are their safety net.